Herdwicks Sheep are a sturdy, strong boned breed. The rams in particular have a broad chest, noticeably thick-set legs and may have strong horns, although as many as 20% are polled or have relatively small amounts of horn growth. The female sheep are somewhat finer boned and should not have any sign of horns. Purebred Herdwick lambs are born largely black often with tips of white on their ears.As they age, the heads and legs become white and the fleece assumes a color ranging from a slate blue-grey to a light grey. 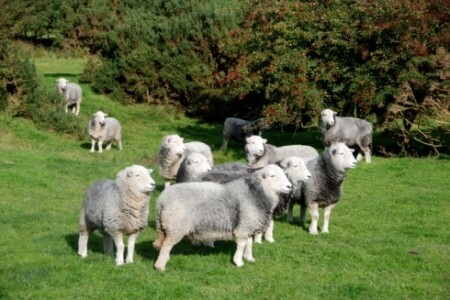 Herdwick sheep are widely considered to be the hardiest of all Britain's breeds of hill sheep. Probably 99 per cent of Herdwick sheep are kept in commercial flocks in the central and western dales of the Lake District. These fells run to over three thousand feet and facing the westerly rain bearing winds they record the country's highest rainfall.